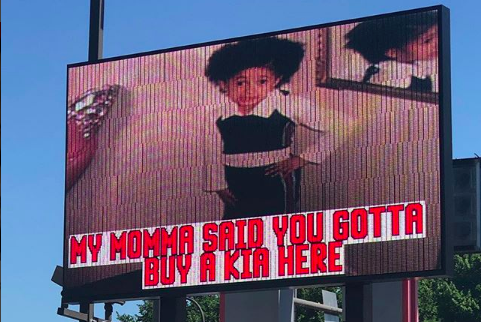 This ad on an electronic billboard for Kia on the Boulevard is using a Cardi B meme to sell cars. This very well may be a classic case of "How do you do, fellow kids." But hey, any way to get people talking about your business, right? Local car dealerships have produced some gems in efforts to advertise over the years. Heck, our own Brian Hickey ranked the 12 best local car commercials of the past decade. Coming in number one on that list was, of course, "The Most Fascinating Kia Dealer in the World" at Burlington Kia, a not-at-all-subtle reference to "The Most Interesting Man in the World" ad campaign for Dos Equis beer. Now, it's another local Kia dealer, Kia on the Boulevard in Northeast Philadelphia, that's trying to capitalize on pop culture references to sell Sorento SUVs. Drivers passing over Red Lion Road on Roosevelt Boulevard recently have been greeted by a photo of a young Cardi B on the dealership's electronic billboard. The ad references a meme that's been circulating on social media, telling customers "My momma said you gotta buy a Kia here." Then, there's an ode to Drake's new song "In My Feelings." And finally, there's a nod to the show "Power" and fans' apparent dislike of characters Angela and Tariq.